Another great addition to the Estes line. The Monarch is a Skill level 1 kit that definately has the beginner in mind. A simple to build kit, yet an impressive kit, the serious rocketeer will want to add to their collection. Standing over 22 inches tall, this rocket can reach 700 feet on standard Estes engines. A preassembled 12 inch parachute returns this rocket back to earth. Repack the parachute, grab a new engine, wadding, igniter and igniter plug and you are ready to blast off again! Estes model rocketry is recommended for ages 10 and up with adult supervision for those under 12. Unless otherwise specified, all models require assembly. Tools, construction and finishing supplies sold separately. In order to launch, a launch system, 3/16 in. 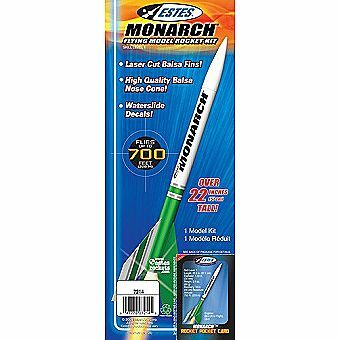 Maxi Launch Rod, model rocket engines, igniters and recovery wadding are required - sold separately-unless otherwise specified.